In the picture above, north is at the top and the image covers 29.7 x 37.1 degrees. Image centre is located at 06:53:59.5, -22:08:32 (H:M:S, D:M:S, J2000) Astrometric data from Astrometry.net. 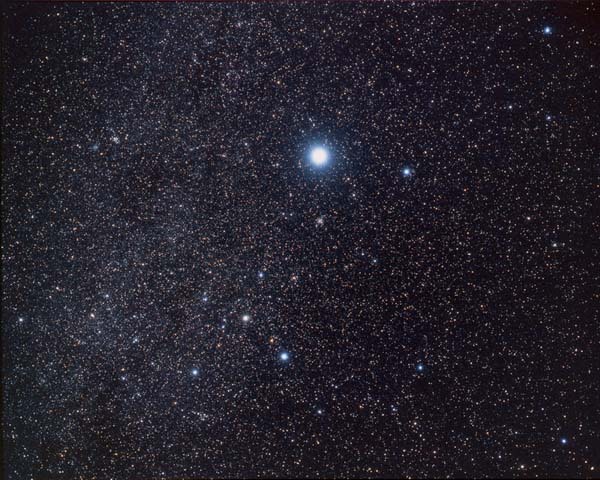 Canis Major (the Greater Dog) is one of two dogs accompanying Orion the hunter across the sky. The other is Canis Minor. The constellation figure is ancient, and was one of 48 constellations mentioned by Ptolemy (83161 AD), no doubt reflecting earlier ideas. The modern stick figure joining the brightest stars (above) certainly has a very doggy appearance. The brightest star in the sky is here, Sirius, the Dog Star, so called because its emanations were thought to affect dogs in the heat of summer, the 'Dog Days' when the star is in the same part of the sky as the Sun. Sirius is bright because it is only 8.6 light years from the Sun and it is in any case it is an intrinsically bright star, 25 times more luminous than the Sun. Adhara (ε CMa), Aludra (η CMa), Furud (ζ CMa), Menkelb Prior (ο1 CMa), Menkelb Posterior (ο2 CMa), Mirzam, (Murzim, β CMa), Muliphein (γ CMa), Sirius (Dog Star, α CMa), Wezen (δ CMa). Adjoining constellations: Columba, Lepus, Monoceros, Orion, Puppis. AAT 16. NGC 2359, nebula around a Wolf-Rayet star In Canis Major.